← Sunday, a long day at the airport. We have just returned from a very successful CC#26 and Zenith open house. It was a great time, and over the next few nights I am going to write up all of the stories and moments from the trip. For tonight, a simpler task to get back into daily writing and updates; Let me share a few notes on Corvair builder and friend Larry Hudson. Larry is a master automotive upholster and top craftsman. He comes from a family that has worked this craft for several generations. After Oshkosh I dropped off the seats from our Wagabond at Larry’s shop in Indiana. As I said then, it is no average production shop, the main car they we doing at the time was a 1959 Caddy Eldorado coupe in coral pink (a factory color). Larry is a guy you can trust with a unique interior in a car worth more than $75K. As seen below, he also does outstanding work on aircraft that are worth a small fraction of that. Larry stopped by CC#26 to drop of the seats. Larry knows that I like dirt simple aircraft with no frills, but said “Just trust me to do something good and simple…I will make it look old school and appropriate.” All I did was tell him the colors I painted the plane (Insignia blue and Nevada silver), mention that I like very firm seats, and he did the rest. The price was reasonable, the quality outstanding, and I think they are very tasteful. I sat in it today, and it was great. Above, the seats back in our plane in our hangar. 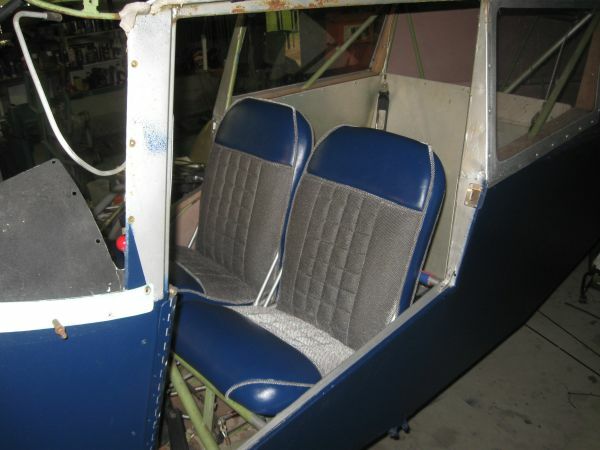 Our Wagabond started out life as a 1964 Piper Colt, and although it is highly modified, it retains the lightweight, folding, independently adjustable, quickly removable seats of the late model PA-22’s. 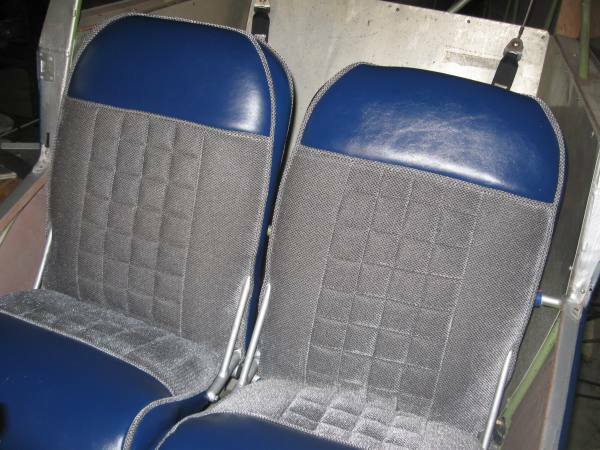 The seats are half vinyl half cloth, with custom made beading made from the cloth. The computer is making the cloth look shiny but in person it isn’t. I am always glad to mention the craftsmanship of builders we know, and this case is no different. If you are looking for interior work on your plane, give Larry a call and talk it over with him, he is a very friendly guy and a first class craftsman. His number is 317-965-2428. Also, Larry wanted to mention that he has a fuselage for sale. It is a 1952 Piper PA-20 pacer, with the tail and landing gear, a mint set of Cleveland wheels and brakes and many other small parts. Like many of us, Larry has too many projects, and he is trimming his aircraft herd down to his own PA-22-108 and his Corvair powered Fokker D-VIII. The Pacer fuselage is identical in size to our Wagabond. Larry has a set of Wag Aero plans to go with it. The FAA frowns upon directly using parts from previously certified aircraft in homebuilts today, but people still do it with the assistance of a friendly and partially blind DAR (this is when they overlook things but can still see the color Green) If you are interested in the fuselage and parts give Larry a call he is asking $2,000. It would save a lot of work on a Wagabond project. Blast From the Past, Corvair College #4, 2003. Above, Larry Hudson and his son Cody working on the Corvair that is in their Fokker D-VIII today. Over the years Larry and his family have been to 10 Colleges. Long known as a good source of core engines in the Midwest, he has often pointed out that he has found more than 60 within 40 miles of his house. Further proof that Corvairs are still plentiful everywhere.